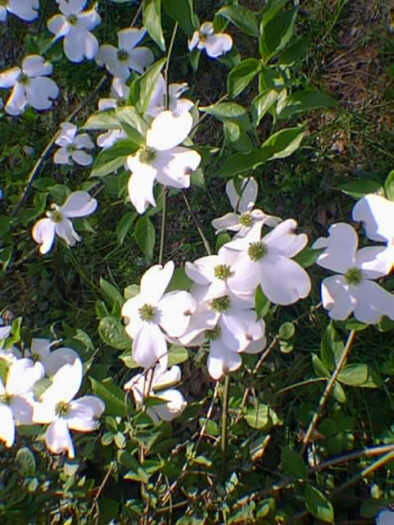 We're going to travel part of the pig trail to look at dogwood and it's a drive you'll enjoy every mile of the way. In the spring when the big white blossoms are spread in flat white clouds, they're a welcome proclamation of the end of winter and a breathtaking display of nature's wonders. Arkansas Highway 16 is the road known as the "pig trail" and the reason it is such a good route for seeing the dogwood is it makes it's way through the Ozark National Forest for most of the distance between Deer and Pettigrew. Access it from Highway 7 about 15 miles south of Jasper and turn west towards Deer. If you're ready for a side trip this early in the drive, the Alum Cove Forest Recreation Area is off to your right about a mile down the road. There's a natural bridge, picnic area, and hiking trail. From Deer, you'll wind along a ridge with forested hills and hillside farms all the way to Pettigrew. The views are pretty and the dogwood a canopy of white in the understory of the spring forest. Between Pettigrew and St. Paul, turn north on Highway 23 to Huntsville. Restaurants, lodging, gas, and groceries are all available there. Turn right (east) on Highway 412 and head towards Old Alabam. Watch, then, for a slightly obscure turn on Highway 21 south towards Kingston. This road follows the Kings River's path through a narrow valley. The Kings is one of the Ozarks' famous float fishing streams, but most the surrounding land is privately owned so respect the rights of the property owners if you stop to look or fish. Kingston is one of those little mountain towns that even local folks would probably describe as quaint. If you're an antique hunter, you won't be able to resist a stop at a couple of shops here and there's also a good restaurant. There's another climb upwards coming out of Kingston and you'll be back of a ridge top with great panoramic views across open fields much of the way. All that goes up must come down and you have a long, steep downwards stretch before you come into the Boxley Valley. You're now in the Buffalo National River country and, if you turn north on Highway 21, you'll find the Lost Valley campgrounds and hiking trail and Ponca. The fields below the bridge at Ponca often have elk grazing in them, particularly in the early morning and late afternoon hours. Turn right (east) on Highway 74 towards Jasper. Sharp curves and a steep climb mark the first mile, but you're right in the trees and the dogwood are all around you. Drive the 12 miles to Jasper enjoying the views from the heights and an occasional glimpse of the river bluffs in the Low Gap area. Some of the best views will open up to you as you start down the mountain into Jasper. From there you can take Highway 7 back to the starting point near Deer.